04:15 Being in the airport at 4.15am is not healthy! 12:00 The Irish team arrived out in Malta at midday, 15 minutes ahead of schedule. So early in fact we had wait for the bus to arrive, even after all the toilet breaks- yes there were 15 girls and 1 lonely man! 13:00 We found our accommodation to our liking in Sliema, lots of space and sunshine. We went for food, an afternoon siesta for 2 hours and then got ready for the first game of the weekend. We (I use this term lightly) were brought to the wrong gym on route to the match. Eventually after two attempts, we arrived at the gym in Cordena. The gym was fantastic with just over 500 seats for all of our 15 spectators. We brought 4 of those â The Nolan Clan!!! The nerves were evident as Malta put pressure on from the start. An experienced side who have played together for years, they ran combinations and slides with their power hitters hitting the line with good effect. Ireland stepped it up in the second set pushing them all the way. We started blocking their outside hitters and quickly Maltaâs frustration show. More confident play from the girls saw better defence from everyone â Leanne Dignam (libero) getting a touch to nearly every ball. It was Naomi Kuncik who was starting to warm up the line on the oppositions side of court. Aileen Minihan setting up our quick attacks through the middle to Debbie Murray and Miriam Nolan while little sis Edel was defending strongly. The set finished 25 â 23 with Jana Langford picking up some extraordinary ball crosscourt. The third set saw substitutions being made in the form of Claire Walsh on the wing, Lyndsy Condell opposite and Fionnuala Nevin middle. The play got off to a flying start with blocks, quick attacks and hard hitting on the wing. The strong blocking of the 2nd set continued forcing Malta to look for something a little extra forcing them into making a lot of errors. Again the Irish pushed the Maltese first six to the pin of their collar 25-23. We played a fourth set with the Croghan twins making their Senior debut causing great confusion on the oppositionâs side. As Sinead played opposite and Aisling played wing, Malta couldnât tell who was who except for the jersey numbers. Both players started well, serving strongly and defending well. The six players fought well throughout the set with some good middle attacking. The last set finished 25- 18. 22:15 After day one, itâs Malta 1 Ireland 0. Weâre now warmed up for the weekend beginning to play more competitive volleyball. Unfortunately Marie Claire Sabogal (setter) got injured prior to travelling and was unable to take part in the warm up match but to the minor injury and weâll no doubt see her on court over the weekend. Our day started at 8.30am with a very healthy (full Irish!) breakfast. After that we headed to the local club Paolaâs gym for a training session to work on our game plan for that evening. We were then free to enjoy the sun, sea and shopping for the afternoon. Jana decided it would be a good idea for us take a cruise around the harbour but that ship never sailed and we ended up sitting docked on the boat for the afternoon! After individual sessions with the coaches, an inspiring team talk, and some serious practice on our team chants (whoop!) we headed back to face the Maltese team for round two. The Irish team started strong, with Leanne, Noemi , Claire and Lyndsey passing extremely well, allowing Debbie and Fionnuala to run quick balls through the middle, giving Ireland an early 8-4 lead going into the first technical timeout. The atmosphere on court and from the supporters was electric and no doubt unnerved the Maltese defence. Ireland also stepped up their offence from the previous evening, with some power hitting from opposite Lyndsey and wing hitter Noemi. Spirits were high as Ireland maintained their lead throughout and took the first set 25-22, the first time Ireland have ever taken a set off the Maltese. Malta refused to surrender, stepping up their defence for the remainder of the game. Setter Marie-Claire recovered from injury to make a strong first appearance, connecting well with Miriam Nolan in the middle and Aisling Croghan on the outside. Despite consistent serving by Sinead Croghan and Edel Nolan, and strong defence from both Jana Langford and Claire Walsh, Malta proved too strong for the Irish, winning the remaining three sets. Rather than being disheartened, the Irish team took a lot of positives from the game, and go into day three more determined to beat the Maltese. With a rare morning off, some of the girls took advantage of the Maltese sun and took a short boat trip exploring the wonderful coastal sights. Others spent the morning with some retail therapy or studying hard for pending exams. With an early game on the horizon, the team returned to an energy-boosting lunch followed by some individual pep talks and a tactical team meeting. With more sets on the teamâs mind â GRRR!!! Upon arrival at the hall the team bonding was evident with excellent enthusiasm and aggressiveness in the warm-up. Different combinations of players were tested with the focus on continuing our blocking form from last night and adding to it raw hitting power! As the Maltese defence was outstanding previously, we aimed to match and in fact exceed their form. With some gutsy performances from the younger members of the team couple with exceptional defensive plays and varied quick attack, the first three sets were hard fought and extremely tight. In the two sets to follow, the Irish fighting spirit was still evident and we finally secured a win in the fifth and final set. Team reward â pizza! Incentive to play with such heart all the time! PS our best wishes go out to the Maltese captain who suffered a suspected arm dislocation in the four set â get well soon. Up once again at the normal time of 8:31 for breakfast, no rest for the wicked! Shortly after we went training. An hour of training meant that we all could relax and wind down for the next four hours after a nice lunch out catching some rays. The match today was scheduled for 5:00 so we left the hostel at 3:30 pm on arrival we found out that this match would be different to the others in that it would be an official international game Ireland v Malta. After a strong warm up we began the first set with aleen setting, Jana our opposite, Noemi and Clair on the wing with Debbie and Miriam running the middle. With substitute Edel Nolan serving strongly and libero Leannes super defence we were unlucky and lost the first set. That evening the Maltese girls brought us out for dinner and after a long day, the crepes we got fairly hit the spot! Afterwards we went to a bar for some dancing and then, true to schedule ,were home in bed by 12! The day kicked off with breakfast once again at 8.30am. We headed off to training at an earlier time of 9.30 with tiredness in the air after 4 days of training and matches. However the Irish squad still worked hard in the session. A few more bruises than usual were picked up with a power serve into the back of Coach Delahunty's head. No hard feelings though, it certainly set off a great laugh among the squad. We saw the first signs of rain on this day which was our reminder of going home to the Irish weather. We returned to the hostel after training and had lunch. After a few free hours the squad met up again and went out for dinner. The food was to everyoneâs liking. And now to the good part! After four days of defeat to a strong Maltese team everyone was hoping to leave on a high. With all guns blazing the girls started with an aggressive warm up. The first set was a thriller and we were unlucky to lose the set as the scoreboard reflected, 27-25. After a wobbly start to the second set we managed to crawl our way back from 15-7 down to 15-12. Unfortunately it wasnât enough to secure the second set and the Maltese won the set 25-17. The third set was our last chance to make an impact. And an impact we made! With strong serving and super blocking the atmosphere and confidence of the Irish side grew. Patience paid off as we took the set 25-23 and the Irish crowd went wild. The team entered the 4th set with high spirits and a hunger to win. The Maltese were shaken by a great display of blocking by the Irish which caused hitting errors by the natives. Quick runs by our middle players split the block leaving our wing players with many opportunities to kill the ball. Once again our hard work paid off taking the set 25-21. Excitement was mounting for the 5th and final set as victory was within reach. With a few deep breaths and jellies to calm the nerves the Irish stepped up to the challenge taking an early lead. Mighty serving under pressure and brilliant determination in defence pushed our girls into an 8-4 lead at the change of sides. It was all about heart for the last seven points for the Irish, with all players, on and off court, as well as the Nolan clan contributing to this. With some amazing rallies and pickups which seemed impossible the Irish team finally flew the flag of victory. The final set was won 15-13. 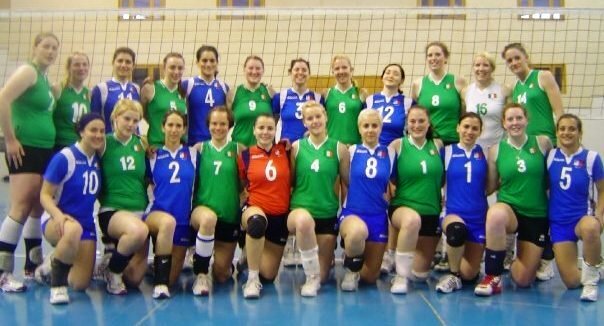 This was the first time an Irish volleyball team had ever beaten a Maltese team and the cheers and excitement from the girls in green reflected this. There was even a tear shed by a very happy coach. It just proves that âstick-with-it-ness abilityâ [Mark Delahunty, 2009] and âGrrrrrâ [Joey Cardiff, 2009] really pays off! The trip was a brilliant success with great team bonding as well as great volleyball. A big âWHOOP WHOOPâ all round!! Fionnuala Nevin, Aisling Croghan, Sinead Croghan.